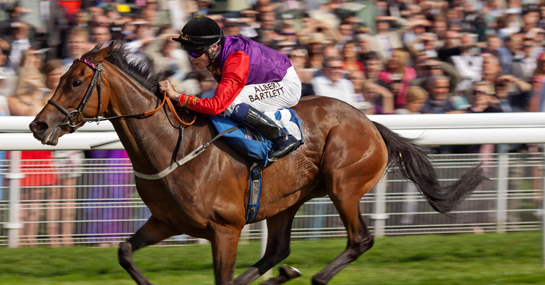 The feature race on day two of Doncaster’s St Leger Festival is the Park Hill Stakes and Set To Music will be a very popular winner should she win. Owned by the Queen, the royal connection means the three-year-old will come in for plenty of support on the track. The 5/2 favourite is vying for favouritism with Meeznah (11/4) and Sense Of Purpose (11/4) and on the basis of recent history, this looks like a straight shootout between the top three in the market. There have only been three winners that have started at 8/1 or bigger in the last 10 years and with Polly’s Mark fourth in the betting at 12/1, it’s worth focusing on the three fancied runners. Meeznah came here last year and was sent off the 2/1 favourite but could only finish third and while David Lanigan’s four-year-old comes here one year older and wiser, three-year-olds have won eight of the last 12 renewals. This has been the plan all year for Meeznah, but in Set To Music she comes up against a very progressive sort who is searching for a fifth win in a row. Sense Of Purpose is coming over to Britain for just the second time having raced 13 of her 14 starts in Ireland, but a second at York last year suggests the travelling will not be a problem and with two wins from two starts at this distance has to be respected. Set To Music is taking on this trip for the first time but the way she won at York last time out suggests the extra two furlongs will not be a problem. The only thing that can stop Set To Music is the trip if she repeats the same level of performance that York witnessed, but she’s such a progressive filly that she looks the pick today.